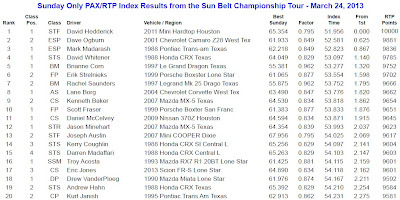 COLLEGE STATION, Texas (March 27, 2013) – The Tire Rack SCCA Solo® Championship Tour and the RallyCross® National Challenge opened last weekend just miles apart, with at least one driver – Brianne Corn, of San Marcos, Texas – taking wins in both events. Corn split time between the Solo site at Texas A&M and the RallyCross site at Texas World Speedway, bouncing back and forth to get in her required runs at both locations. The effort paid off, with Corn taking the B Modified win in Solo in her Janco/Hoosier Le Grand Dragon as well as the Modified All Wheel Drive class win her Brianne Corn Racing/Rally Ready Driving School Subaru Brighton. More than just wins, Corn also turned the fastest overall times at both events – a 111.278 combined time of her two best runs on the Solo pavement, and a weekend best 770.505 aggregate of all 12 runs on the RallyCross dirt. Corn’s performance wasn’t the only notable one of a weekend that featured 157 drivers on the Solo course. In C Stock, Kenneth Baker ran the best class time of the final day to close the first-day hole in his Autcross.com Mazda MX-5, but fell just 0.030-second shy of Daniel McCelvey’s JFA Racing/TrackTime Performance Nissan 370Z. Like McCelvey, Mark Madarash opened up a lead in his class, then fought to keep it through Sunday’s runs. 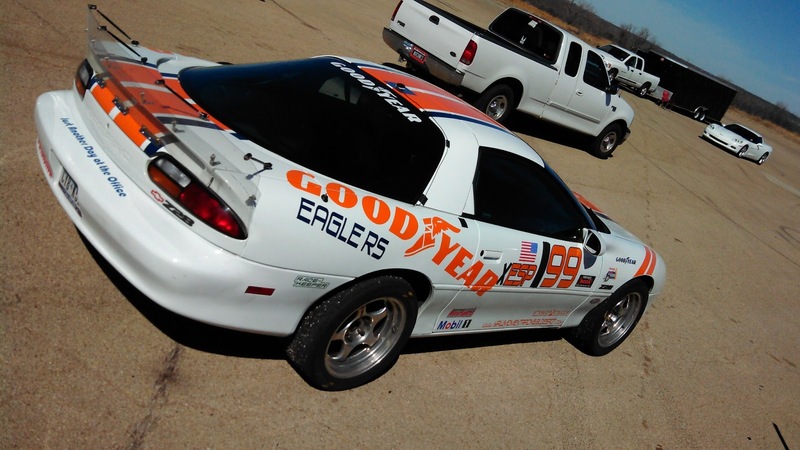 Madarash was the quickest E Street Prepared machine on Saturday, then posted a time in his Pontiac Trans-Am on Sunday that left him just 0.116-second ahead of Sunday’s quickest-in-class car, the Goodyear Eagle RS/Strano Parts Chevrolet Camaro Z28 of Dave Ogburn. It was, however, possible to take a victory from behind on Sunday. Andy Hollis led the opening day of Street Touring R, behind the wheel of the Thanks Kyung and Michael Mazda Miata. With a prophetic team name, Jason Minehart erased that deficit in the Team Underdog Racing Mazda MX-5 to just sneak out a 0.095-second victory in the 14-car class. On the RallyCross dirt, all 12 runs are combined for the final time. 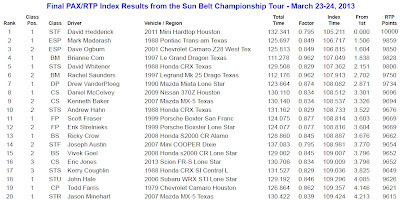 That makes the 2.963-second margin of victory that Kevin Corn’s Brianne Corn Racing/TexasRallySport.com Subaru Impreza in the Prepared All Wheel Drive class agonizingly close. 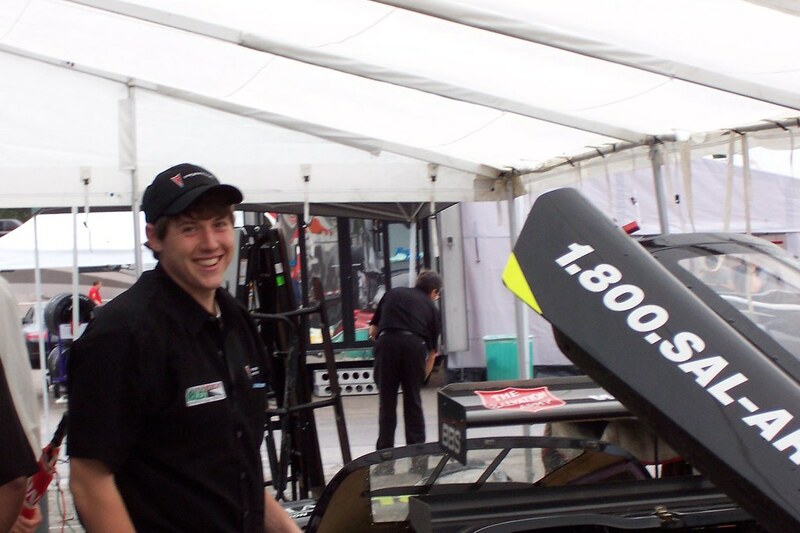 Corn had consistently completed the course faster than runner-up Yohanan Harvey’s Norman’s Tire Service Subaru Impreza, but had 14 seconds in cone penalties – compared to just two for Harvey – to narrow that gap and nearly cost him the win. 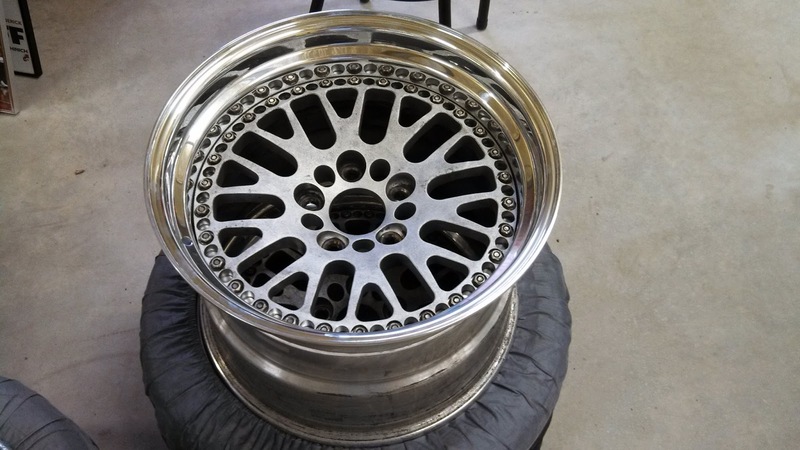 The Tire Rack Championship Tour – running the traditional National Tour format – moves immediately to this weekend’s Pacific Southwest Championship at Qualcomm Stadium in San Diego. More information on the Tire Rack SCCA Solo Program is available atwww.scca.com/Solo. 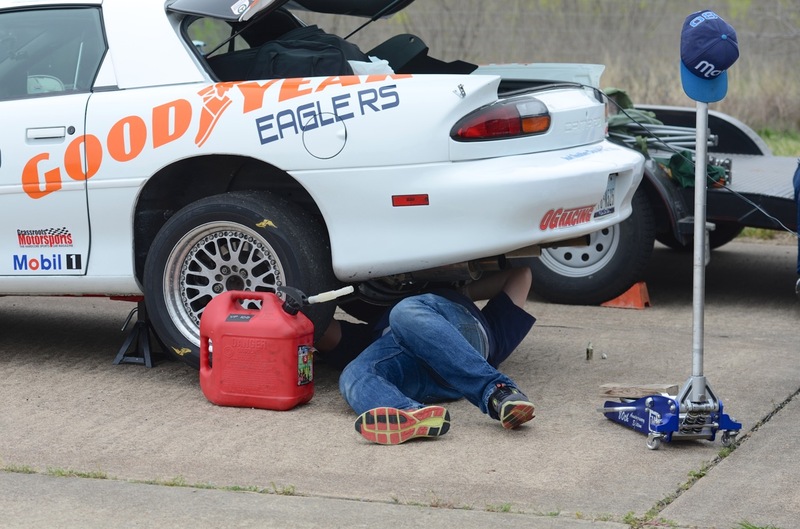 More information, including results, from the Tire Rack College Station Championship Tour event is available athttp://www.scca.com/events/index.cfm?eid=5453. 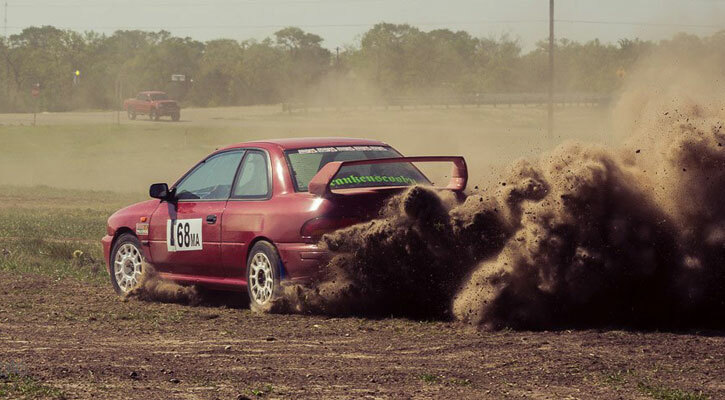 Information on the RallyCross National Challenge program is available at www.scca.com/RallyCross. 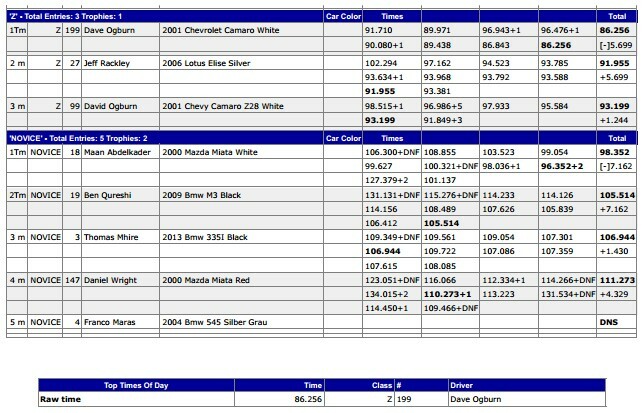 Details on the SouthWest Division National Challenge at Texas World Speedway, including final results, can be found at http://www.scca.com/events/index.cfm?eid=5599. Follow SCCA on Twitter @SCCAOfficial, or like the Club on Facebook at www.facebook.com/SCCAOfficial. This past weekend was my 3rd trip to the Mineral Wells Airport in the last four weekends. 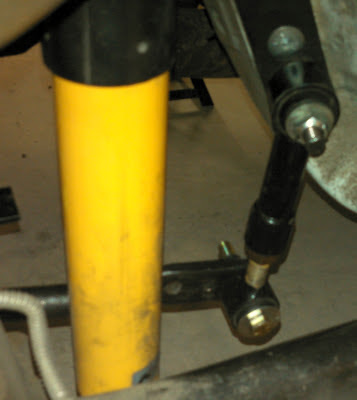 That's not something I would normally be happy with, but I continue to learn more and more about my live axle 2001 Camaro. For this event, Equipe Rapide Sports Car Club setup to separate timing systems and did a "practice" ProSolo style event. The Texas ProSolo event is in April in Mineral Wells so it was a good chance to drag-start the Camaro and practice my reaction time. We did not have a Christmas Tree starting light for the event so it wasn't truly a ProSolo style event, but it was close enough and I really enjoyed it. The courses were a bit short, but 12 quick runs gave us good practice for the drag start and mirrored courses. 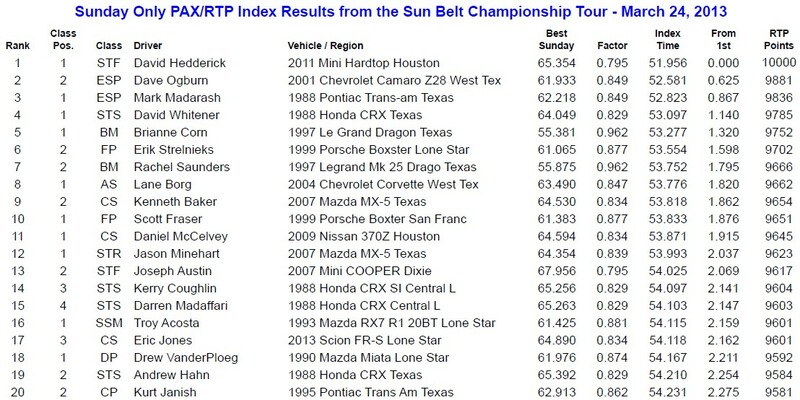 I finished 3rd in X(Pro) class behind Mark Madarash's ESP Trans Am and Jeremy Foley's ASP Evo. This also put me 3rd overall in PAX out of 54 drivers. 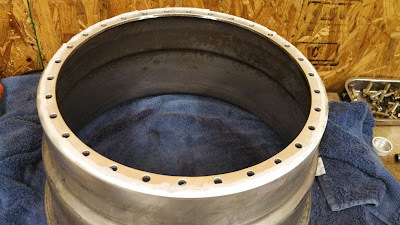 I did a bit of work in the shop getting ready for the event. 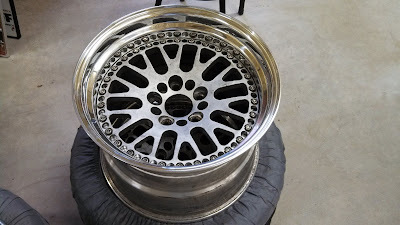 I modified my 3-piece CCW wheels with different wheel outers. It allowed me to test different wheels widths for this event....which was a bit difficult given the short courses and back to back runs. 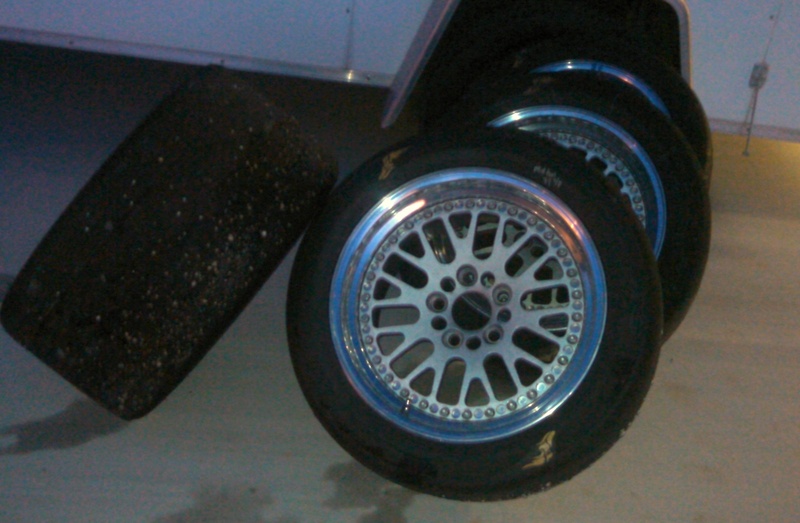 It was hard to keep tire temp consistent and read how the wheel width was affecting grip/response. I think I was able to get a basic feel for how the tire responds to different wheel width, but this will surely be a continuing development item. After getting the new wheels sorted, it was time for new brake calipers and rotors in the front. 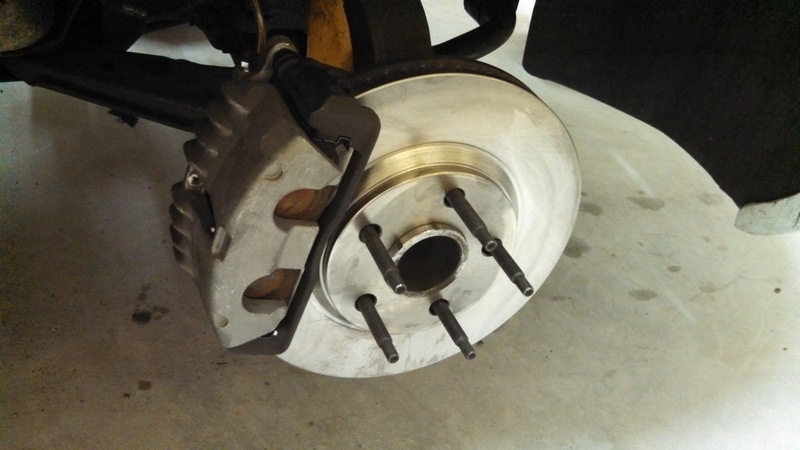 The front calipers were the original units and the right front was dragging so it was definitely time for a change! Here are some pics of modifying the CCW wheels. 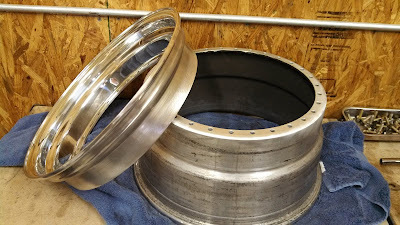 It was my first time disassembling and reassembling 3-piece wheels, but it was fairly easy and CCW has good instructional videos on their website. 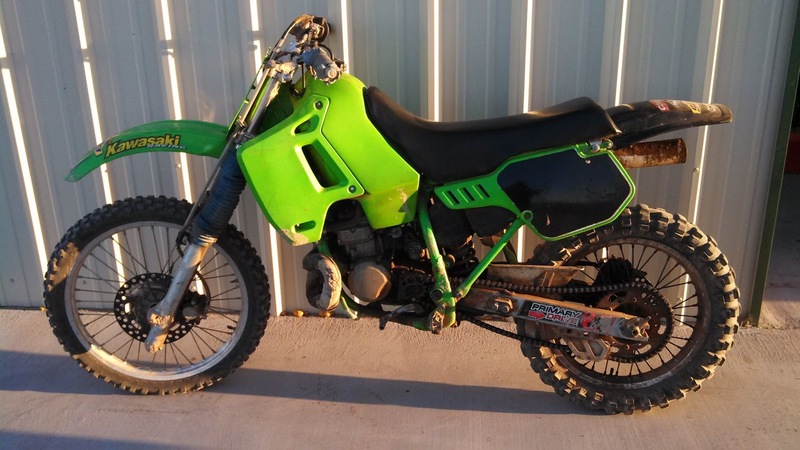 New gearbox oil, fresh fuel with pre-mix, a little chain lube, a little coolant, and a new spark plug and my faithful Kawasaki dirt bike came back to life after about a year of dormancy. I can't believe it's been a year since I've ringed this thing's neck....hopefully I will have more time for trail riding in 2013. 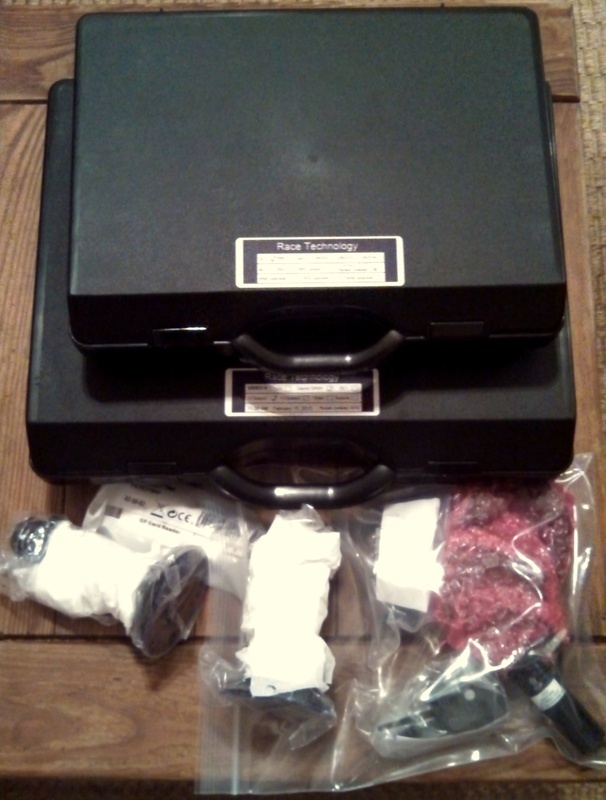 The ProSolo points championship takes points from three events, so I am cutting it close by only running three events. It's all my schedule will allow so I will have to make them count. The SCCA Solo Nationals are once again in Lincoln, NE after Labor Day (September 2nd - 6th) where we will be competing for the ESP National Championship. The SpringNationals Championship Tour over Memorial Day should be a good warm-up for the big dance. We kick the National Solo season off with the Texas Championship Tour in College Station, TX later this month. We will also be trying a new style event this year with the Match Tour (think Evo shootout from previous years) event in Mineral Wells, TX. The bracket shootout on Sunday of the Match Tour should be an exciting change from the average event....if you do well I guess! I will also be competing for a local club points championship with the Equipe Rapide Sports Car Club. I am running in the PAX based X(Pro) class against a few other National Champions so the competition should be tough. 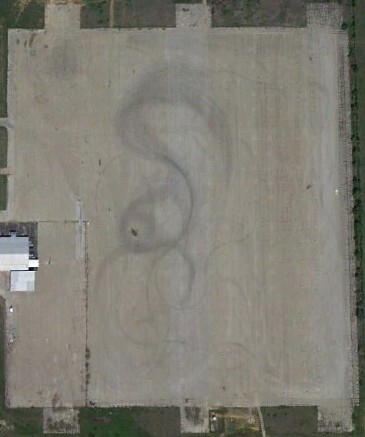 My karting schedule for the year is TBD. 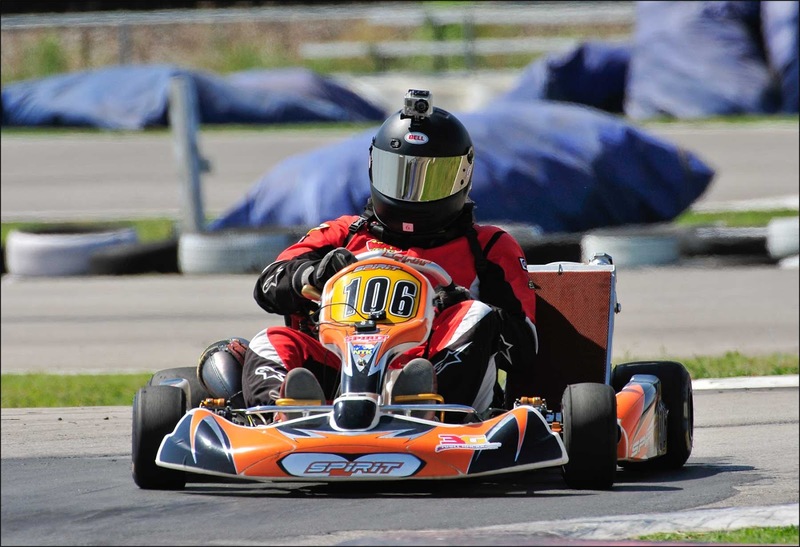 The West Texas Karting Association's schedule is up in the air at this point, but I plan to run 5-6 local races this year. I need to get back in the shifter! It's been too long. My buddy Josh showed me this YouTube video the other day. It looks like quite possibly the most fun form of racing possible - Finnish forest rally stages, snow, and high-revving motors! I did some searching and found some very cool onboard video posted below. Last weekend, my parents met me in lovely Mineral Wells, Texas for two days of autocross fun in the Camaro. We planned on using the weekend to get my Dad seat time in the car away from National-event stress while trying to setup our new Race Technology DL1/Video4 package and try out some different suspension settings. On Saturday, we raced with the Lone Star Chapter of the BMWCCA. 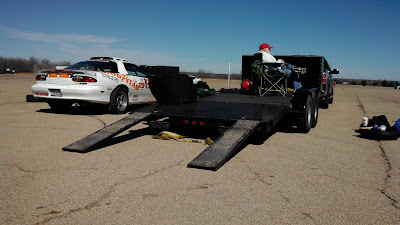 We had about 30 cars (mainly BMWs) on a cold Texas morning and the BMW setup an ambitious, long and high-speed course. Each driver got 10 runs (5 in the AM and 5 in the afternoon). We rode together for each run except for our final run which we used as a flyer for the timesheets. I ran a 86.256 on my final run which gave me FTD and the win in Z-class. On Sunday, we headed back to the Mineral Wells Airport bright and early to help setup the day's autocross course. My Dad and I both ran in X-class which is their PAX-based class for experienced drivers. Out of the 12 drivers, there were quite a few National Championships and many Solo Nationals trophies so the competition was about as tough as it gets for local autocross. Similar to the BMW club, we got 4 runs in the morning and 4 runs after the lunch break. During lunch, I made a change to the rear ARB setting and really like the balance at the end of the day. It was difficult to tune during the heats because we were running very frequently with a two-driver car and fairly small heats. I finished with a best time of 52.956 which put me in P5 in X-class and 5th overall in PAX. Unfortunately, I hit the last cone on the course on my final run which was a 52.461 and would have put in 3rd overall and only 0.2s back from Mark Madarash who won X-class in his venerable '88 Trans Am. Overall, the weekend was a great start to the season and I had a blast racing with my parents. We continue to make progress with the ESP Camaro and that makes for exciting racing.